This is something I find people asking me all the time. 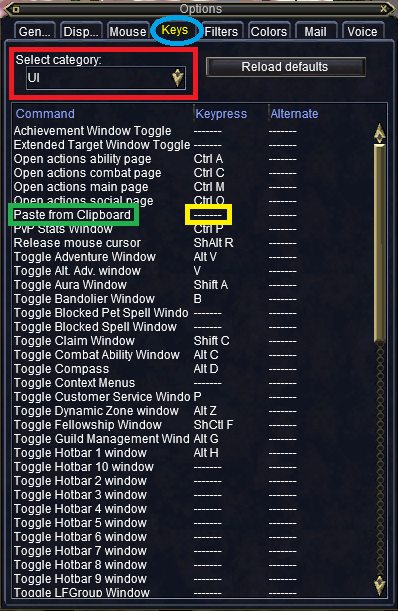 "How do I paste text from my clipboard into EverQuest chat boxes?". It's actually very easy to do. It does require a little bit of setup, but that is easy to do as well. 1. First, we need to open the options window. This can be done by pressing "Alt O". 2. Next, we need to click on the "Keys" tab. This is shown by the Blue circle in the image above. 3. Our next step is to select "UI" from the "Select Category" dropdown. This is shown by the Red box in the image above. 4. Now, we need to locate the "Paste From Clipboard" option. This is shown by the Green box in the image above. 5. And finally, we need to decide on which key we want to assign this command to. You can use any key, or combination of keys that you wish. When you decide on a key, you can simply click on the empty area to the right of the "Paste From Clipboard" text (as shown by the Yellow box in the image above). When you do this, you will be asked to press a key. At this point, you should press the key, or comination of keys, you wish to assign this command to. If the text turns Red when you select a key, this means that there is currently another command associated with the key you chose. In this case, you should select a different key. And that's it! All the set up is now done. Now you can copy text to your clipboard (Ctrl C in Windows). In game, in your chat box, type which channel you wish for the text to go to (example, /gu), then hit the spacebar, then press the key or keys you have just set up to paste from clipboard. If nothing happens, it could be that you have copied too much to your clipboard. There seems to be a 409 character limit.